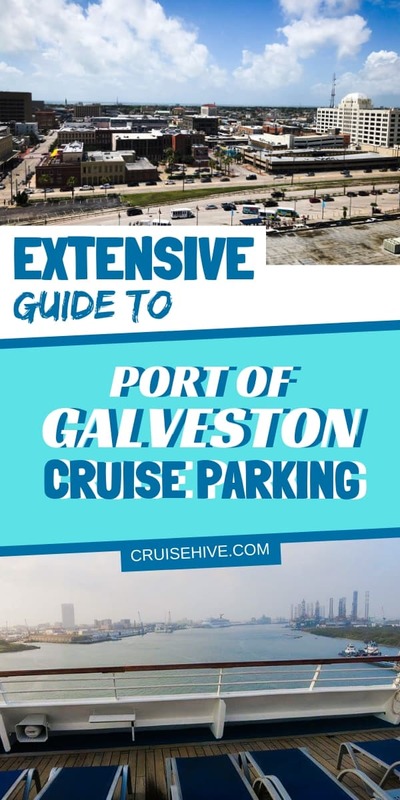 Travel guide on Port of Galveston cruise parking to help those departing on a cruise vacation. Covering parking lots, locations and prices. As one of the biggest cruise departure ports in the United States, the Port of Galveston also offers the cheapest cruise parking around. In this extensive Galveston cruise parking guide, we list all the lots to make it easier for you to decide which is best while on your vacation at sea. Parking lots and garages in Galveston will compete for your business, offering the cheapest prices and the best availability. It’s good to do your research and decide which parking option will be best for you and your car. Even the official parking lots at the port have cheaper rates than you’ll find at most departure ports, making the Port of Galveston the top choice for cruises. Below we’ve put together all the information you’ll need to choose where you wish to park for the duration of your cruise so you can make the best choice for your trip. Keep in mind that for nearly all lots it’s best to book your parking online before your trip. For those who plan to stay in a hotel the night before and/or after your cruise, we’ve also included a few hotels in the area that include parking in their cruise packages. Do note: The rates could change at any time by the parking lot operators so do check official sites for the very latest. Let’s start with the ports very own parking lots. Prices available there aren’t very expensive. Port of Galveston cruise parking also offers ADA Handicap Accessible parking, a secured garage within walking distance to the terminal, 24/7 security, and shuttles to and from the cruise terminals. Multi-leveled garage parking is available for most 7-day cruises and is filled on a first come, first serve basis. This lot offers pre-paid discounts for their uncovered lots, so if you don’t want to park in the garage, booking in advance is the cheapest way to go. The Port also provides a complimentary parking space to Disabled American Veterans and Purple Heart recipients. Price: From $50.00 for a four-day cruise (pre-paid). These are Port of Galveston unofficial cruise parking lots. Located near and around the cruise port. Prices will varies and often depend on which cruise ship you’ve booked. Port Parking offers similar fees like many other lots in the area with shuttle service. One difference is they were the first to offer charging spots for electric vehicles. Just make sure to book your spot in advance, and you have your choice of a Tesla EV Charger or a generic Clipper. There is also a choice of covered parking lots. Port Parking is located on 202 37th Street and is very near to the cruise port on Harborside. Price: From $55 for outdoor with shuttle and indoor walking for a four-day cruise. Galveston VIP Cruise Parking is another lot located on Harborside near terminals 1 and 2. You can park and then walk to the terminals. Or, if you prefer, drop everyone and your luggage off first. While you park, the ship’s porters will help your group get where they need to go. Being this close to the cruise ship comes with a higher price point, so only park here if you’re willing to spend the extra bucks. Price: From $75 for a four-day cruise. Cruise Park is a locally owned and operated small business in Galveston. 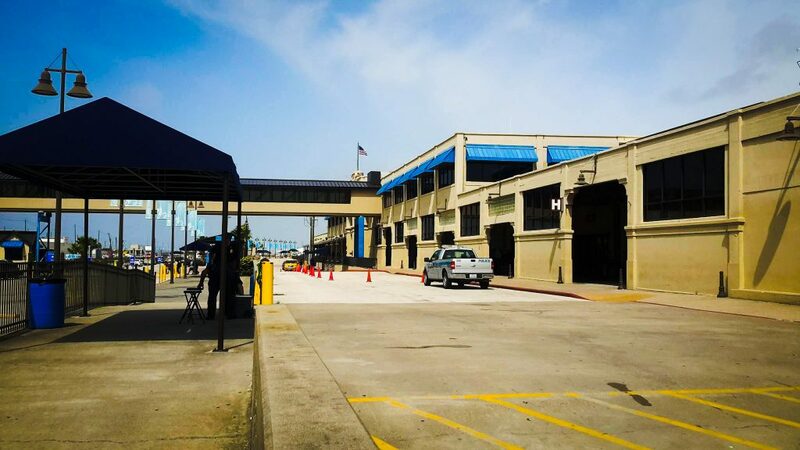 It’s conveniently located on Harborside Drive directly across from the Port of Galveston cruise terminal 2. One of the cheapest “park and walk” lots available, cruise travelers can easily park here and walk to the ship’s terminal, a trip that only takes about 5-7 minutes at an average walking pace. There is no shuttle provided. The only downside to this lot is that it is only available for those taking 7-day (Sunday through Sunday) cruises. If your cruise is shorter or longer than 7 days, you’ll need to find another parking option. Galv Park is a private parking company with various cruise parking locations. Each location has its own prices, and some even offer monthly parking options. All parking is first come first serve and you pay at the pay stations located in the center of the parking lot. The best thing about this lot, besides the price and location, is that it’s one of the few lots in the area that offers charging spots (5 spaces) for electric vehicles. Located on Seawall Blvd and Holiday Drive, this parking lot is one of the cheapest available. The only downside is that it doesn’t offer shuttle service. Being about 2 miles from the port that can be an issue. This parking lot is located near downtown Galveston and is a short walk to all the island’s attractions, shops, hotels, and restaurants. If visiting shops and restaurants on the Strand is on your bucket list, this is the perfect place to park your car before your ship leaves. Park and pay, then do as much sight-seeing, shopping, and dining as you need before your ship leaves. Discount Cruise Parking (DCP) is a good option for passengers cruising with any of the three major cruise lines including Carnival, Royal Caribbean, and Disney. The fast and effient parking service is located near the poert and bookings can be made online using their form. 81st Dolphin Parking offers parking services for Carnival Cruise Line and Royal Caribbean ships. It is a family-owned business and on their web sites mentions that they are the best cruise parking in Galveston, Texas. The shuttle serice departs continsuly every 30 minites for cruise passengers. Just like DCP, Falstaff’s prices vary depending on the cruise and time of year, but generally costs anywhere between $8 and $9 per day. Falstaff offers free shuttle service to and from the cruise terminals. Their shuttle even has handicap accommodations. The lot also offers parking for oversized vehicles like RVs or buses. Just be sure to book for an oversized vehicle to avoid any additional charges upon arrival. Falstaff provides 24 security and is one of the few full enclosed lots available for cruise passengers. Lighthouse Parking offers good rates for Galveston cruise parking along with shuttle service to and from the cruise port. The lots provide video surveillance and on-site security, so you know that your care is safe. Lighthouse accepts competitor coupons of up to $10 off covered parking for the same ship on the same day. Use coupon code SAVE10 when you book to get a 10% discount on your parking cost. Galveston Park N Cruise offers both outdoor and indoor parking, both fully secured. This lot is also the closest parking to the cruise terminal making it super easy to park and cruise. Just park your car and it only takes a few minutes to walk to the terminal. They do offer drive-up parking, but it’s best to book in advance to make sure you save your spot. Located about as close as you can get to the cruise terminal, EZ Cruise Parking provides uncovered and covered parking, including six charging stations for electric vehicles at no additional cost. They also offer discount pricing if you decide to forego the shuttle on your reservation, which can easily save you about $10-$15 on your total cost. Additionally, EZ Cruise Parking recently launched a Customer Loyalty Program for frequent passengers. Sign-up is free, and for every dollar you spend you earn one Loyalty Point. 10 Loyalty points gets you $1 off a later reservation. If you save at least 400 points, you can get a $40 discount. For those of you who plan on arriving the night before your ship leaves, rather than the day of, you might be interested in finding lodging for that pre-cruise night. If that’s the case, you’ll want to find a hotel that not only has a cruise package but offers free parking for the duration of your cruise so you can avoid any additional parking costs. We’ve compiled a short list below for you of hotels near the Port of Galveston that meet that criteria. Located about 5 miles from the port, this hotel will give you free parking and a shuttle to the cruise port for just $10 more than the usual room rate. Book ahead of time to secure this deal. You can make a booking here. All you must do is stay one night here and you’ll get free parking, and shuttle service on the weekend only. If your ship leaves during the week, you’ll need to arrange for alternate transportation or choose a different hotel. Find out more details. This hotel sits right by the Seawall. They’ll provide you with free parking during your cruise and can arrange for transportation to the cruise port through a third-party service. This service costs around $8 per person. Take a look right here. Book your pre-cruise stay through the hotel’s website and you’ll get both parking and a shuttle to the port for no additional cost. Here’s the official site. If you purchase the Hilton’s “Park & Go” package through their website, you’ll get free parking for up to 7 nights and a shuttle to and from the cruise port. All the details can be found here. Since Galveston started hosting cruises out of their port, the island has grown into one of the biggest tourist towns in Texas. Even with its small size, the Port of Galveston has serviced over 2 million cruise passengers and supplied people with almost 14,000 jobs. The Port of Galveston has two terminals available, making it easy to accommodate any cruise coming in or out of its port. Both terminals are located on Harborside Drive within a block or two of each other. The terminal you use depends on which cruise you’ll be taking. For the purposes of using GPS or map programs, the port suggests using 22nd Street and Harborside Drive to find the terminals. Likewise, use 33rd Street and Harborside Drive for Parking Lots A and B (if you have chosen to park in the official lots). The port has plans to build a new terminal on Pier 10, and a new parking lot is also being planned as well. This will enable the port to handle some of the larger ships from Royal Caribbean. Whether or not you plan on parking at one of the ports official lots, or you’ve chosen alternative parking, the port recommends driving directly to the terminal first to drop off your luggage and other passengers. Porters will help with the luggage, while Port Police will help direct you to the appropriate parking lots. Several of the alternative parking lots offer free shuttle service for everyone in your group and all your luggage, so if you’d rather park first you can do that, as well. Upon returning you have the option to get your luggage first or pick up your car and then drive to the loading area to retrieve your luggage. The Port of Galveston services cruises from three different cruise lines: Carnival, Royal Caribbean International, and Disney Cruise Line. We won’t talk about their varying itineraries as ships are constantly being repositioned to different homeports. If you have yet to decide on what cruise you’ll be taking out of Galveston then simply use the form below to search and check prices. One way in which these two lines differ is in how they process guest check-ins. Depending on what sort of person you are, this can be a deciding factor for you. Royal Caribbean allows guests to check-in at any time. From when the ship first opens till it’s about to leave port. This is great for people who like to get in early, or for those running a bit behind. The downside to this is that it can lead to long lines of people waiting to check-in and board the ship. Carnival, however, has moved to a staggered check-in. Guests are given a specific time to check-in, usually a 30-minute window. If you arrive before your scheduled window you’ll be turned away. This eliminates the long lines and offers a more efficient way of boarding the ship. The demand for inexpensive cruise parking is high in Galveston, TX. Local business owners have risen to the challenge to offer secure, affordable parking. Many even provide free transportation to and from the cruise ports, while others are located so close that walking is just as painless. Many lots are similar in pricing and amenities, while a few offer lower or higher prices. That said, the most you’ll pay for a 7-day cruise is $110 ($15 per day), which is still a good deal compared to parking around other US ports. If you wish to spend a little extra time in Galveston, either before or after your cruise, consider booking a hotel that offers cruise parking and transportation to help minimize trip costs. Find out about these things to do in Galveston, TX for before or after a cruise vacation from the port. Plenty of ways to experience the Gulf coast city. If your cruise is leaving from the Port of Galveston in Texas, here are some helpful hints for what to expect at this point of embarkation.